2018 this 3rd Edition of "West Coast and Beyond"
The book is a journey along the west coast, through Namaqualand, the northern Cape on to the Namibian border and the diamond fields of Kimberley. The historical and economic development of this vast area is described, as is the discovery of copper and diamonds, missionary work, fauna and flora. With this book, the reader embarks on an incredible journey to the west coast and the immense land that lies beyond, as far as the Richtersveld, Augrabies Falls, Kgalagadi Transfrontier Park, the border with Namibia and the diamond capital Kimberley. Following the shrill call of seagulls along the windswept coast which claimed countless ships and lives, he crosses through small towns and villages that are deeply steeped in history, each one telling a story of determination and courage against seemingly insurmountable barriers. As he travels past vineyards, wheat fields, spring-flower carpets, steel mills and iron-ore terminals, jagged mountains, tranquil rivers and lagoons where flamingoes stalk majestically and colour the water pink, a whole new world opens up before him, something will stir in him. This land is calling him as he relives the fate and fortune of explorers, steadfast missionaries, gamblers, adventurers, politicians and soldiers before him. He touches on the often arduous lives of ordinary people, who make this region so unique. 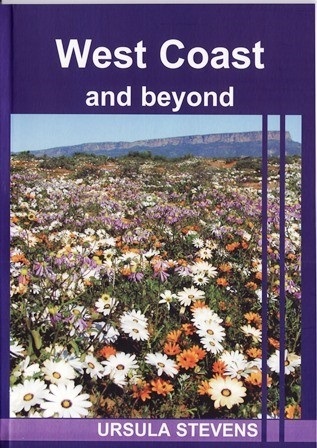 “West Coast and beyond” [isbn 978 0958 495189] is the 7th title by the author in the Wanderlust Books travel series which includes: - Garden Route Travels, The Cape of Good Hope, The Winelands Explorer, Die Weinstrasse am Kap, Cape Town on Foot and Kapstadt zu Fuss.